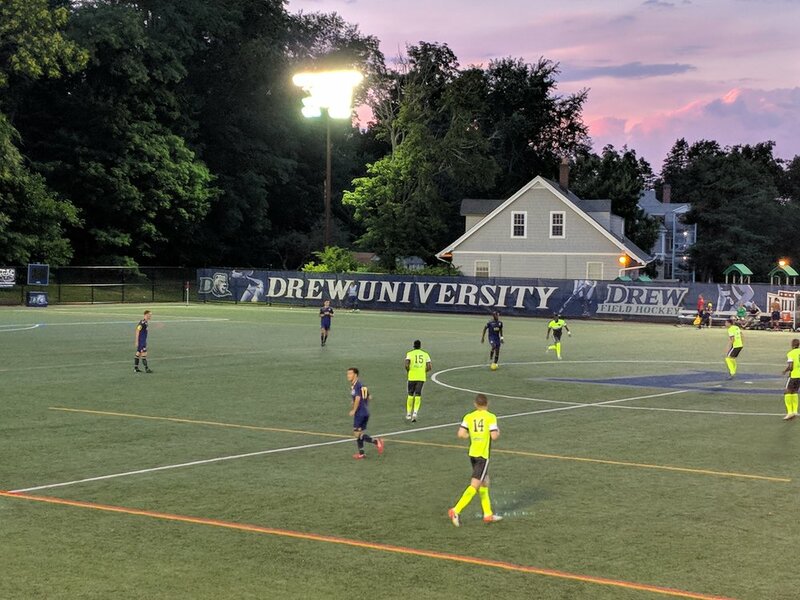 MADISON, NJ – FC Monmouth’s inaugural season in the National Premier Soccer League came to an end on Wednesday night after they were eliminated from the playoffs in the Keystone Conference Semi-Final by FC Motown at Drew University, 4-1. It took less than five minutes for FC Motown to take the lead. A long throw-in from the left side into the box found the head of Christopher Katona, who directed it toward Walter Calderon. The attacker faked a shot with his right foot, cut it onto his left, and sent a low-driven effort past goalkeeper Scott Weigel and into the bottom right corner. Twenty minutes later, the hosts doubled their advantage. Matt Nigro’s out-swinging corner kick into the box was headed in by Christopher Riordan from point-blank range. Katona extended FC Motown’s lead to three goals in the 38th minute. After receiving a pass in stride just outside of the box, he blew past defender Andy Martinez with ease and slotted a grounded strike past Weigel at the near post. “They did a good job of handling our best guys pretty well, so it was just an unlucky result,” said Pereira. “They’re the best team in the league, and they just outplayed us today.” Forward Jordan Saling said that Motown’s dominance was helped by their tactical setup. “Even in the beginning of the game, Motown showed us a lot of respect in the way they played. They didn’t play their normal style, they dropped deep and didn’t let us in behind,” he said. Minutes before halftime, FC Monmouth drew a goal back through midfielder Chase Covello. From just outside of the box, Covello’s free kick deflected off of the wall and lofted into the bottom right side of the net, leaving the goalkeeper motionless. Two minutes into the second half, FC Motown restored their previously held three goal lead. A low cross was sent in from the byline and Martinez’s mis-hit clearance rolled into the path of Katona, who swung the ball past Weigel with his left-foot from close range. With the loss, FC Monmouth’s season came to a close at the conference semi-final stage. The club finished the regular season in the fourth spot of the Keystone Conference table with a record of 6-3-1. Watch the full game recording here with direct links to each highlight.